In 2016, The Dilawri Foundation was pleased to make a half-million-dollar donation in support of Luther College High School (Luther) in Saskatchewan. This donation established the Dilawri Award for Students of Promise for students who would not otherwise be able to afford to attend Luther. We were delighted to get a chance to talk to one of the Students of Promise, Shannon Sherk, and hear how the scholarship has impacted her life. Q: How has Luther added to your education? A: Luther, besides all the amazing academics, has taught me lots about how students and teachers can come together to work on huge, school-wide projects such as musicals or the Luther Invitational Basketball Tournament. There is such an emphasis on teamwork and everyone having a role to play. Q: What is your favourite aspect of attending Luther? A: My favourite aspect of Luther would probably be the community. Everyone is there for each other and supports each other. There is also a lot of intermingling between the grades, and because of small class sizes, you get to meet everyone in your grade. The staff are also super supportive whether it’s your teachers, coaches or club leaders, the staff go out of their way to support the students in all of their endeavours and make Luther such a welcoming place. Q: How has the Dilawri scholarship changed your life? A: Well, for starters I am able to spend a lot of my time at a school where I feel like I belong with everyone around me. I have met so many awesome people and so many new friends. It means the world to me to be able to go to a school with an amazing community, Christian environment, and the International Baccalaureate program. I have been a Future Luther Student since I learned about Luther about four years ago and I am happy to be going to the school of my dreams. Q: Do you think Luther has positively changed your personal life? If so, how? A: For sure Luther has changed my personal life! I have had the opportunity to meet so many amazing people and I have found some new things that interest me. There is also a positive atmosphere that blankets the entire school, student body, and staff. Q: Are you active in the extracurricular activities? If so, which ones? 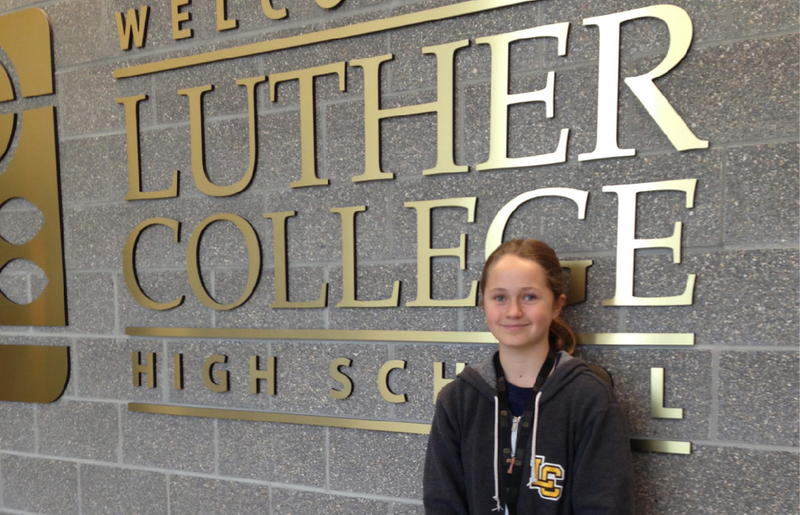 A: At Luther, I just finished helping with the sets for our annual musical, I am currently a part of the Luther girls’ soccer team, Amnesty club, Outdoor Ed club, and I am a member of Student Representative Council. I am looking forward to being a part of the school’s improv team and one act group, as well as being a part the Ultimate Frisbee team. Q: What do you think makes Luther different from other schools? A: There are so many things that make Luther different from other schools. There is an emphasis on academic excellence, and an expectation that everyone contributes to the positive school atmosphere.